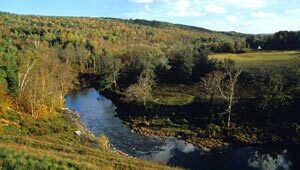 In 1996 TPL helped the Vermont Institute of Natural Science acquire 28 acres in Montpelier as a new nature center. The property, which includes a house and small barn, lies in the flood plain of the north branch of the Winooski River, and consists of open pasture, riparian woodlands, and emergent wetland. It lies adjacent to the North Branch Nature Center, and is within walking distance of the Vermont State House.